Japan's PM has said he would consider meeting North Korean leader Kim Jong-un to try to settle a row over Pyongyang's kidnapping of Japanese nationals. Shinzo Abe said this was one of the options open to him. He was speaking a day after Tokyo's special adviser arrived in Pyongyang, amid media reports that he would try to re-open talks on the issue. Pyongyang has admitted abducting a number of Japanese nationals in the 1970-80s to train spies. Their fate has been a key priority in Tokyo's ties with Pyongyang. The two countries currently have no diplomatic relations. 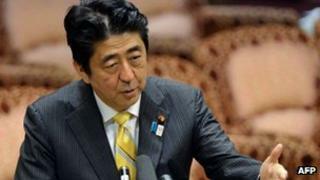 Speaking in parliament on Wednesday, Mr Abe said he might consider holding talks with Mr Kim. "If a summit meeting is deemed as an important means in considering ways to resolve the abduction issue, we must take it into consideration as a matter of course in negotiating with them. "Our fundamental objective is to resolve the abduction issue, including the return of all abductees, revelation of the truth and the handover of the perpetrator to Japan," the prime minister added. However, he declined to comment on the purpose of special envoy Isao Iijima's visit to North Korea. Mr Iijima's arrival is significant because he is a close confidant of the prime minister, says the BBC's Rupert Wingfield-Hayes in Tokyo. He also negotiated two previous trips to Pyongyang by Japan's former Prime Minister Junichiro Koizumi in 2002 and 2004, our correspondent adds. In 2002, after a visit to North Korea, Mr Koizumi succeeded in securing the release of five Japanese abductees. Pyongyang says the other abductees are dead, but Japan is not convinced and wants more information. Mr Abe vowed to find out what happened to them when he returned to power after elections in December 2012. Mr Iijima's visit comes amid a slight relaxing in tensions in the region, which has been on alert following North Korea's third nuclear test on 12 February. Meanwhile North Korea says a detained American has begun to serve his sentence for subversion. Pae Jun-ho, known in the US as Kenneth Bae, was last month given a 15-year term of hard labour for what Pyongyang called hostile anti-government acts. A report from state-run KCNA news agency said he had started to serve it out at a "special prison", without elaborating. Mr Bae was detained last year after entering North Korea as a tourist. Pyongyang has rejected the idea it is using him as a political bargaining chip to force talks with the US. In the past, Americans detained in North Korea have been freed after visits to Pyongyang by high-profile officials, including former presidents Bill Clinton and Jimmy Carter.